A weekend of high run scoring has seen the Tigers clinch some important victories over the University of Queensland to begin the two-day season. 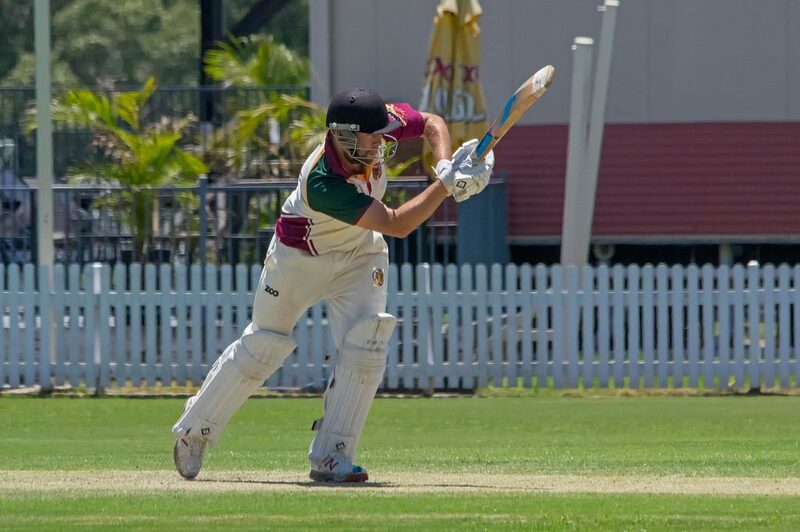 First grade had a mountain to climb as they travelled away to University on day two, but a fantastic innings of 140 from Steven Moss saw the Tigers chase down the runs required for victory in the 81st over of play. A mammoth partnership of 165 between Moss and skipper Leigh Drennan (95) stabilized the Tigers innings after Smith and Howse fell with starts to their name. James Bazley (35) also played an important hand in the Tigers runs chase, combining with Moss to push the total past 300. Cameron French and Bailey Stewart then finished off the job started by the top order to secure a famous victory. Second grade fell agonizingly short of victory in a thriller on Peter Burge Oval against the same opposition. The day started poorly for Redlands, with four of the top five batsmen falling for single figure scores. But a patient innings from Michael McEwan (35), who batted for near on three hours in testing conditions and with wickets tumbling around him, helped get the Tigers back into the contest. Jimmy Carr (58) continued his good form with the bat to capitalize on the work done by McEwan, as did Scott McAuliffe (71) and Jamie Ryan (51). When Ryan fell with the score on 263, the Tigers still required 19 runs for victory. Leonard Watt and Rob Ballarino came together for the last wicket thereafter, but with light fading and storms approaching, a delivery slipped through Ballarino’s defenses to end the Tigers’ hopes of victory late in the day. Third grade capitalized on their fantastic bowling display on day one to earn first innings points away from home against University. Bailey Lavender and Dylan Kritzinger were the main men with the bat for Redlands, scoring 40 runs each and seeing the Tigers through to the first victory of the new season. Fourth grade went down to the same opposition on Fred Kratzman Oval, but a fantastic display from the Tigers top order in the second innings made the loss a little easier to swallow. Jacob Apted (4/44) and Lincoln Rosiak (3/73) ensured the Tigers were in the field for no longer than an hour and a half on the second day, but a 142 run lead to the visitors meant victory was beyond reach. Paul Bonney allayed fears of an outright loss, scoring a quick fire 40 from just 16 deliveries to get the Tigers second innings off to a flyer. When he departed, Jesse Burns picked up the slack, sending the University bowlers to all parts of the ground to score one of the finest hundreds seen on Tigers soil. His partnerships with Crick (40) and Holdsworth (33) held the Tigers innings together and ensured there was no chance of University walking away with outright points. As the day drew to a close and light began to fade, Burns was dismissed for a remarkable 164. Fifth grade recovered from early trouble on day two but were unable to chase down University’s total of 183. Dylan Grey was the only man to really get going in the Tigers run chase, scoring 66. The Tigers bowlers dug in during the second innings and had the opposition 5 down for 41 when stumps were called. Sixth grade one had an outstanding win over University on Ron Field Oval, recovering from 5/61 overnight to chase down 182. Matt Fay (59) was the main man with the bat for Redlands, and in combination with James Vidal (43*), saw the Tigers through to victory nine wickets down. Sixth grade two also claimed first innings points. Taking on Toombul away from home, the Tigers dismissed the opposition for just 129. Mark Burt was the chief destroyer for Redlands, claiming five wickets. Sixth grade three have made a wonderful start to their clash with Bribie Island at 7th Brigade Park. Ryan Short (84), Greg Thompson (60), and Brayden Laffan (31*) helped see the Tigers through to 6/215 at stumps. Redlands will be looking to claim their second win of the season when they return to bowl next weekend. The Tigers ladies side made a winning start to their new season against Ipswich/Logan on the road. With the game shortened to 25 overs a side thanks to Sunday’s inclement weather, the Tigers won the toss and elected to bowl first. Keeley Richards (2/3) and Jess Sanders (3/15) used the conditions to their advantage to help restrict the home side to 9/94. The Tigers were reduced to 6/55 in reply, but some mature batting from Denise Sanders, Hannah McLaughlin, Jess Sanders and Jess Pang saw the Tigers over the line with two overs to spare.